Milwaukee Public Television's production of the Milwaukee Ballet's wildly popular production of Peter Pan will play to a national primetime television audience in spring 2014. The original adaptation of J. M Barrie's classic story is scheduled to premiere on MPTV Friday, April 18, 2014 at 9 p.m.
Michael Pink's adaptation of J.M. Barrie's most famous work is performed by the Milwaukee Ballet. This production brings to life Peter Pan, Tinker Bell and many of the notable characters, including a larger than life alligator that crawls along the orchestra pit. 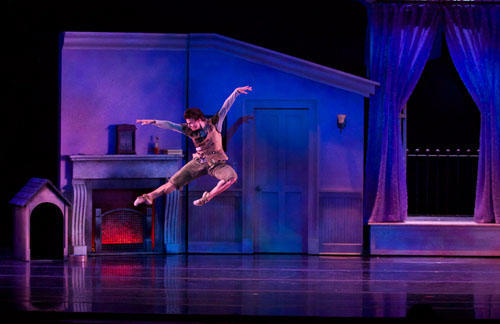 Choreographed by Milwaukee Ballet Artistic Director Michael Pink, "Peter Pan" took Milwaukee by storm when it premiered in 2010, playing to sold-out houses and earning nightly standing ovations. Due to popular demand, Milwaukee Ballet restaged the show in 2012 when MPTV recorded this timeless ballet. Featuring an original score from British composer Philip Feeney, this impressive production features dancers flying high over the stage and a larger-than-life crocodile that crawls along the orchestra pit. The production, taped at Milwaukee's Marcus Center for the Performing Arts, features Leading Artist Marc Petrocci as Peter Pan and rising star Valerie Harmon as Wendy. The production boasts a notable creative team, including Emmy Award-winning lighting designer David Grill, and Emmy Award-winning producer/director Phillip Byrd, who produced the program for broadcast. Includes dancer bios, kid's study guide, and more. Theatre West Virginia is preparing to return for its 54th season following a shutdown caused by financial problems. The Harlem Globetrotters will crowds Tuesday night in Charleston and Wednesday night they will do the same in Huntington.